"A woman thought to have been the last surviving female veteran of the First World War has died. Gladys Powers, who was 109, died in British Columbia in Canada earlier this month. At 15, Mrs. Powers lied about her age and joined the Women's Army Auxiliary Corps, before moving to the RAF as a barracks waitress. It is thought she was the last female veteran from any country to have served in the war, following the death last month of Charlotte Winters. The Minstry of Defence has been unable to produce records of her war service as British First World War files were destroyed during the Blitz. Born in Lewisham, London, on May 10th 1899, Mrs. Powers spent her pre-war years travelling with her father, Frederick Stokes, who was a business man. Mrs. Powers emigrated to Canada in 1920 after marrying a Canadian soldier. Derek Twigg, Minister for Veterans said: "More than 80,000 women served in our Armed Forces during the First World War. 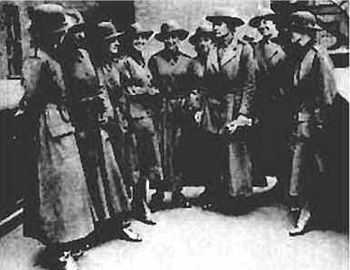 Although they may not have realised it at the time, these early women volunteers did much to break down the barriers for all those service-women who have come after them and who continue to serve their country today so proficiently and professionally." As the First World War dragged on and casualty figures steadily rose, more and more opportunities arose for women to enter the workplace. The Munitions factories paved the way but soon, women were working on the railways, public transport and even doing men's work on the land. A contemporary North Devon newspaper published an avalanche of complaining letters from male readers who had glimpsed, from a railway carriage, a woman ploughing fields, showing that not everyone was happy with this development, even in war time. In 1916, losses at the front climbed even higher and military authorities began to look for ways to release men from certain duties here in England so they could be sent for service at the front. Rather grudgingly, it was agreed that women would be able to perform many backroom tasks; it was further agreed that these women should not have military status even if they were to be sent across to France. And so the Women's Army Auxiliary Corps came into being*. Every woman who joined had to be a volunteer, enrolling for one of four categories of work - Cookery, Mechanical, Clerical or Miscellaneous. There were Controllers and Administrators ( = officers), Forewomen (= Sergeants), Assistant Forewomen (Corporals) and Workers (= Privates). Records are available for those who enrolled in the (fairly urban) Devon places listed below. Women played a vital role in the economy of Devon's rural areas during the First World War and very few of them could be spared for the WAAC - their task was to work on the farms to keep the nation's food supplies coming. Although many served on the Home Front, others who enrolled were called upon to show great bravery when they came under fire on the battlefields and in April 1918, nine were killed at Etaples. After this event, their Chief Controller said that as they had been sent to France as replacements for soldiers, the enemy was quite entitled to try to kill them. Out of all the women who served, only two were to receive war medals - a corporal and a Deputy Administrator. 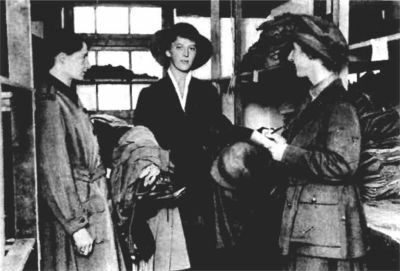 As a mark of her Majesty's appreciation of the good services rendered by the WAAC both at home and abroad since its inauguration and especially of the distinction which it earned in France during the recent fighting on the Western Front, Her Majesty has been graciously pleased to assume the position and title of Commandant-in-Chief of the Corps, which in future will bear the name of Queen Mary's Army Auxiliary Corps.